Question: What is 115 people strong and has over 2,300 years of experience? Coordinating the epic amount of the construction work we do here in the Ministry of Transportation and Infrastructure requires a special team of individuals to guide and supervise that work as it happens in the field. Those special men and women belong to Provincial Field Services and are responsible for the supervision, technical consultation and direct field administration of grading, paving and sealcoating works throughout the province. It’s an enormous job and this team is up to the challenge. The Provincial Field Services main office is located in Kamloops, near the heart of the province and acts as a hub for the ministry’s construction activity across B.C. Field Services staff is spread out across the province in order to supervise projects as they ‘roll out’. They ensure the construction delivered meets the Ministry’s standards and specifications as outlined in the contract documents. Many of the men and women who work in Field Services have built their knowledge and expertise through their extensive experience in the field. Nearly 80% of all Field Services staff started their careers on the ground level, being mentored and developed by those that did the same before them. It’s all about the transfer of knowledge and sharing in the experiences of the field. Many team members work experience dates back to the construction of the three phases of the Coquihalla, a significant project delivered in the mid eighties. Field Services works closely with technical schools as part of the Ministry’s Technical Entry Level Program (TELP) to build the Field Services team for the future. No matter what their work history, anyone who works in this branch will tell you that every day brings variety and challenges. Construction sites can be found in all areas of the province, from the busy corridors of the Lower Mainland and Vancouver Island, to the excitement of breaking new ground on the Winfield to Oyama project – even the rehabilitation and expansion projects in support of the Peace oil and gas initiatives fall under their watchful eye. 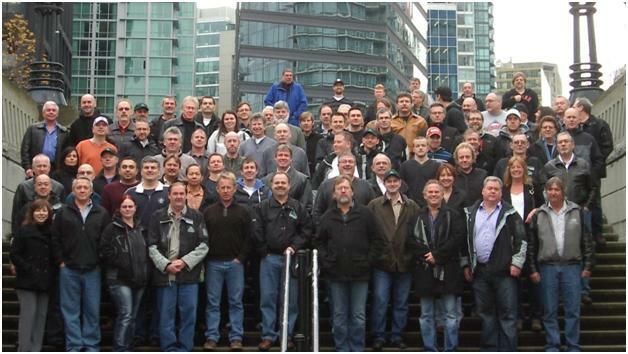 In addition to the supervision of construction projects across the province, members of Field Services also connect with industry stakeholders, like BC Roadbuilders and the Consulting Engineers of BC, set standards in construction language and performance management, and offer other complimentary support services, like bridge construction support and project debriefings throughout the year. So, the next time you see a project in progress, look for our ministry representatives from Field Services, and when you do, you will know they are out there, doing what they love. The successful projects Field Services delivers are due to the incredible passion and dedication of its people, and that is simply amazing!